As we left the fascinating Cleopatra exhibit at the California Science Center, I thought we might try the much touted Bottega Louie for brunch. Driving south on Grand, we noticed a crowd milling about on the corner near the entrance of the building. Since parking is free downtown on Sundays, we skipped a pay lot next to the restaurant and parked on the street. Walking into the bustling restaurant, I immediately knew our chances were slim in acquiring a table. The hostess stand had people thirty deep waiting to give their name. With a seven-year old yanking my hand, I knew she couldn’t wait more than a few minutes. Instead, we walked up to the candy-colored pastry counter and browsed the refrigerated cabinet filled with wrapped sandwiches and salads. We purchased a couple sandwiches, pastries and some drinks to take to a nearby park in the FIDM campus. A week later, my husband and I ventured downtown on a Sat. night to try and gain access into Bottega Louie. With a Dodger game and USC game playing nearby, I hoped the traffic might be lighter. Next, a host greeted us with “Mr. And Mrs. Weinlein? Your table is ready. Please follow me.” We only waited about 10 minutes. Seated in a nice corner booth under the soaring ceiling, I remarked that the décor is white, black and gold. It has a unique European vibe, as if one was in Paris or Rome. Our server welcomed us by name and offered complimentary flat or sparkling water. We ordered one of each. The restaurant has a top-of-the-line filtration system and delivers clear glass bottles to each table. Another server arrived with warm braided French bread and placed it on the white butcher-style paper with a dish of butter. It was heavenly. Their interesting wine list offers many that can be ordered as a half pour, full glass or by the bottle. I ordered a glass of crisp Rose Refosco Rosanto Bastiriich Fruili 2010 and my husband ordered a generous size glass of Downtown Brown draft beer. My wine arrived in a little carafe that filled my glass almost to the top. The restaurant is owned by a group of very successful Hedge Fund managers. These businessmen secured the lease to this cavernous space in 2007. It took them about two years to finally build it out and open their doors to the public. As part of revitalizing downtown, the group has made a positive impact in bringing jobs and vitality back to this area. Downtown residents and employees have enthusiastically embraced the restaurant. It’s name, Bottega, means workshop or work place of a master artist in Italian. The baked items are a work of art. Most of the delicious breads, pastries and cakes are baked in a commissary kitchen about two miles from the restaurant and delivered fresh twice a day. We started with the Mache salad with brined roasted chicken, avocado, sliced celery, scallions and julienne snap peas. It’s served with a Meyer lemon and dressed lightly with extra-virgin olive oil. It lacked oomph and tasted too healthy to me. According to a NPR story, Mache lettuce arrived in the U.S. almost thirty years ago when some Bay Area chefs brought the seeds back from their travels in France. It’s also called “lamb’s lettuce” and is dark green with a slightly sweet and nutty flavor. To me it looked like baby spinach leaves. The 14 oz. Rib Eye is a generous piece of marbled and flavorful meat. It’s grilled with salt and pepper. For $2.50 extra you can substitute the Kennebec French fries or the Portobello fries with a basil and parsley aioli. The Kennebec potato is larger with thin skin to peel easily. The potato holds together better when cooked than other potatoes. It doesn’t get mushy. We had a dish of delicious flash fried Brussels spouts with toasted pistachios to accompany the Rib Eye steak. I’ve been told by fans of the restaurant, that the lasagna is excellent with its Bolognese meat ragu, béchamel, buffalo mozzarella, ricotta and Grana Parmesan cheeses. Also the pork chops, served with grilled onions and apples are popular. There are 24 small plates for $10 each. Salads are $10 and $12 depending on what type you order. Both the 14 oz. New York Strip steak and the Rib Eye are $35. Desserts are numerous with a large chocolate soufflé (needs to be ordered 20 minutes ahead) or a plate of warm housemade beignets served with a raspberry dipping sauce popular with diners. 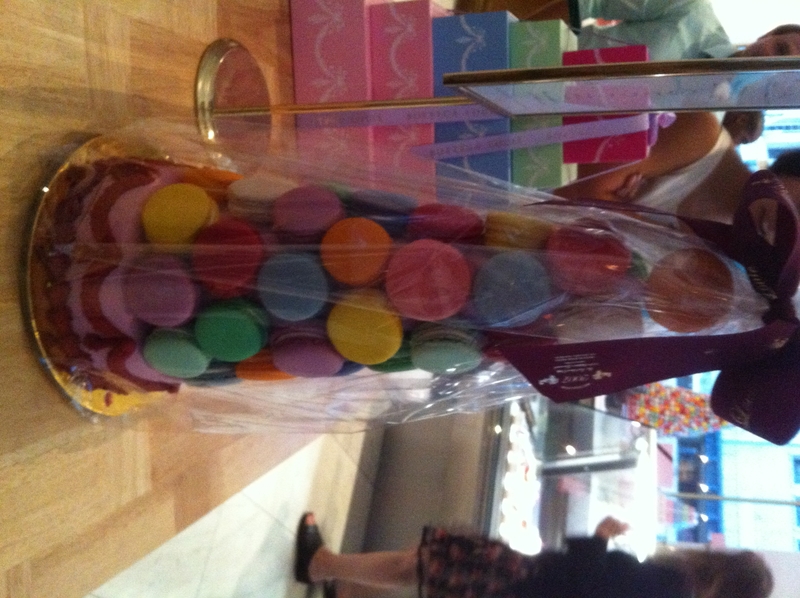 Walking away without a stop at the massive patisserie counter is difficult. Situated next to the front door are glass shelves filled with pastel-colored Le Grand macarons with gorgeous flavors that include chocolate orange, rose and violet cassis. The trays of buttery croissants, cranberry lemon scones, pain au chocolat and coconut rocher will tempt your taste buds. We bought a few flaky and gooey treats for our breakfast the next day. 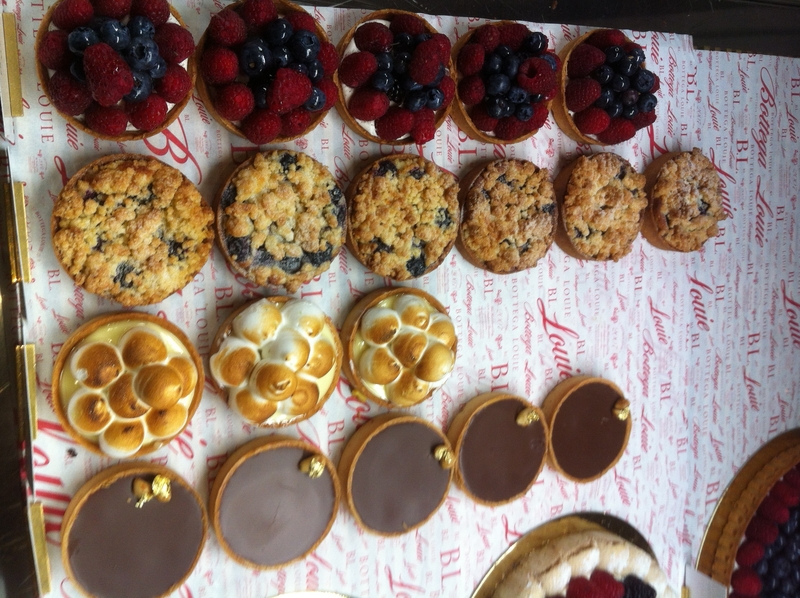 It’s a great way to enjoy the European delights of Bottega Louie in the comfort of our own home. The restaurant is open from 7 a.m. on weekdays and 9 a.m. on weekends. The Patisserie is open at 10:30 a.m. Sat. and Sun. Brunch is from 9 a.m. to 3 p.m. The restaurant closes at 11 p.m. during the week and midnight on the weekends. They do not take reservations. $$ 700 S. Grand Ave. (213)802-1470.